The economy being how it is, every dollar counts. When you decide to splurge on a new game you want to make sure that it is not only worth the money, but also a good fit for you and your playgroup. This post is designed to help you make an informed choice about a popular game. The Resistance: Avalon is the one game on my shelf that always ends up getting packed whenever I go to social events. Whether traveling to an ultimate frisbee tournament or going on a mission trip, Avalon is inevitably stuffed in my backpack. It has come to the point, that some friends have asked to take my copy on trips that I’m not even going to! So then why is this game such a hit among such a diverse group of people? 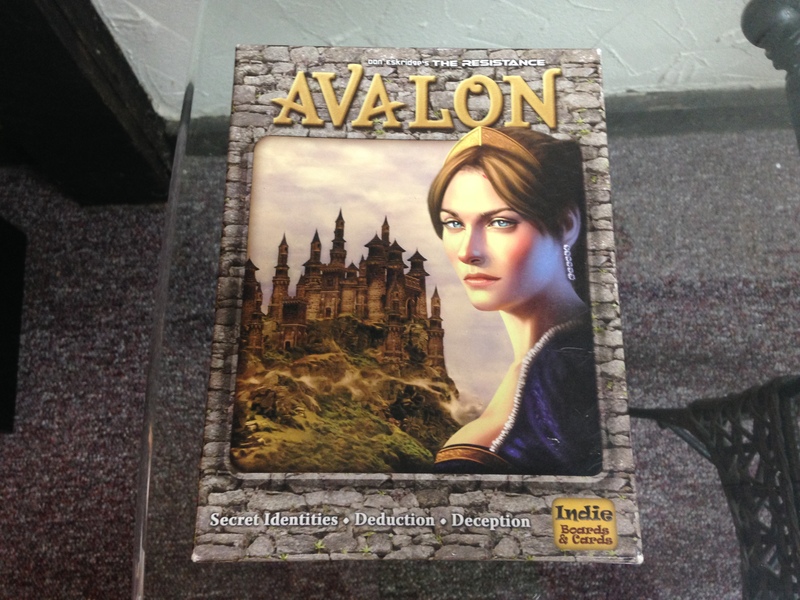 First and foremost Avalon is easy and neither requires, nor rewards, gaming jargon or experience. Many classify it as a gateway game (an introductory game to non-gamers) due to its simplicity and high-satisfaction rate even after losing. 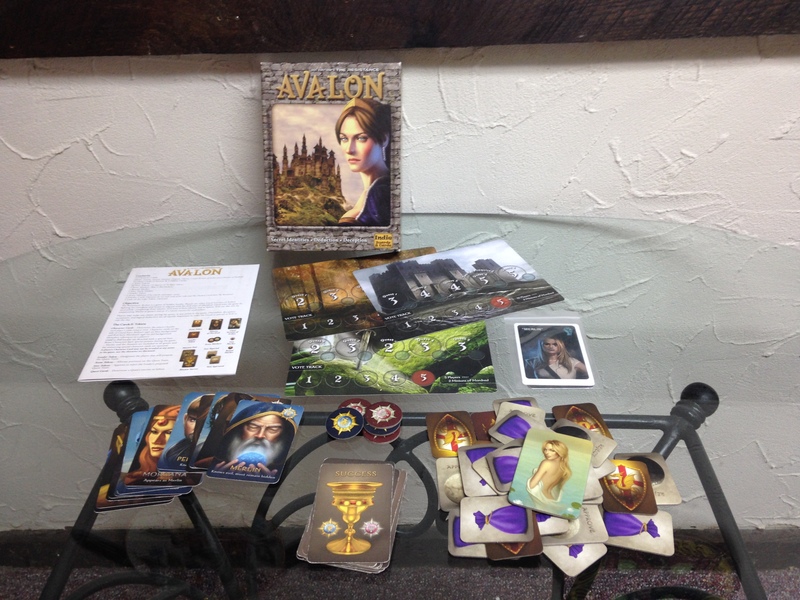 Avalon is an unapologetic Arthurian legend riff on the party classic “Mafia”, but with a heavily streamlined approach. As such I tend to think of Avalon as a party game, and in this function it has proved to be irreplaceable when looking to turn a lazy spring break afternoon into a rambunctious firestorm of accusations, denials and Monty Python quotes. Although Avalon supports a minimum of five players, I recommend playing with as many people as possible in order to really create the chaos that this game thrives on. Additionally, the game truly shines when players are familiar with one another as it makes the necessary element of deception that much more rewarding. After selecting the game board matching the number of players, you will assign one player to act as the leader (a sort of executive officer for the game). 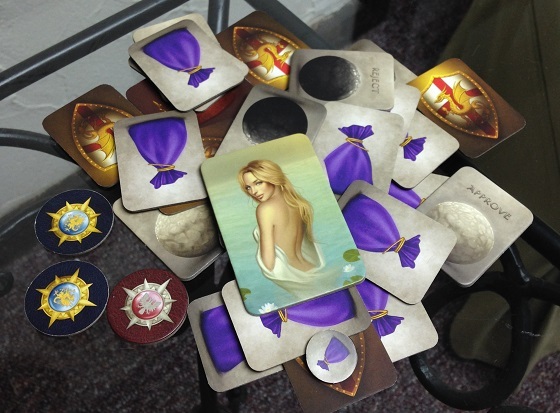 Each player is then dealt a card to be kept secret from everyone else. 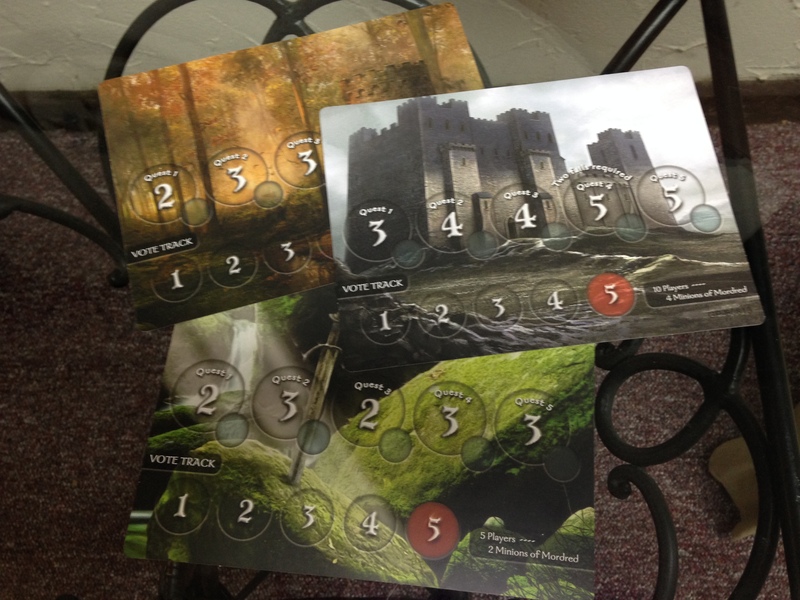 These cards will assign them their role for the game. There are some that are simple “Servants of Arthur” or “Minions of Modred” and you can play exclusively with those if you wish, something I recommend doing on the first play through. 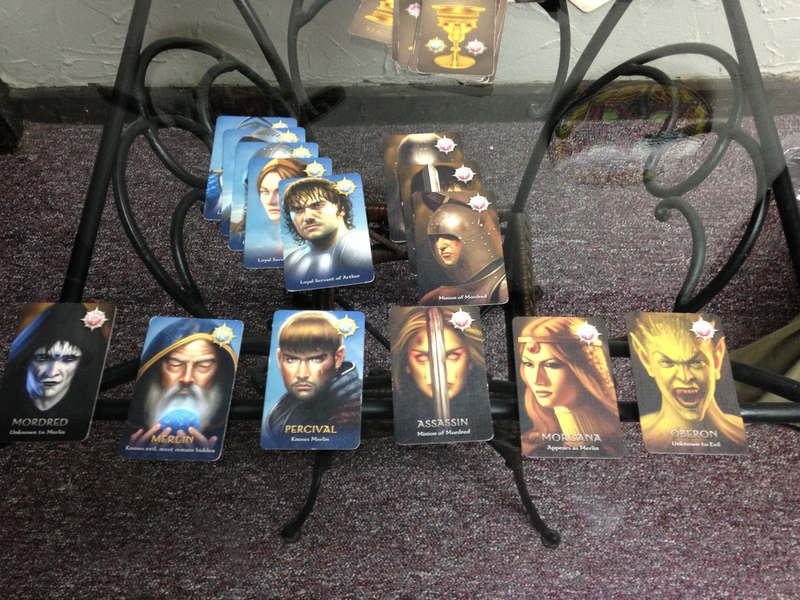 However the game truly comes into its own when you incorporate the specific character cards such as Merlin, Percival, and Morgana. These characters all are either good or evil just like their blank counterparts but they have special traits that will either allow them access to special information or the ability to spread disinformation to other players. When playing with all special characters and the maximum of ten players, the table becomes a veritable sea of lies, deceptions, guesses, and bluffs. Despite the initial complexity of the roles and making sure everyone understands them, the basics of the game itself are easy. Everyone is, on the surface, a knight in King Arthur’s court and must go on up to 5 consecutive quests to seek the holy grail. Each round a team is voted on to go on the quest, and those knights can submit either a pass card or a fail card based on their affiliation, with only one fail being required to fail the entire quest. Whichever team meets their objective on 3 out of the 5 quests will win the game. The joy is found in how players react to missions failed, and how they soon begin to analyze every element of their fellow knight’s behavior in order to hopefully construct a team without any villains. These interactions make for some of the most enjoyable moments in any game I’ve played. Aesthetically, this game looks great. 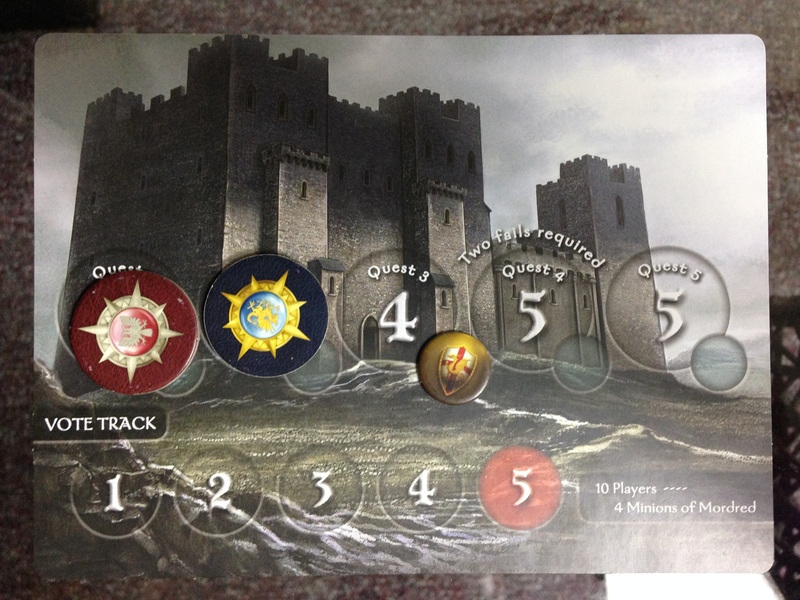 Every element from the box to the cards has beautiful artwork and really lends itself to the Arthurian theme. The cards are very high-quality which is good considering the beating that mine have taken. The boards are made of a thinner card-stock which is fine considering three boards need to fit in one small box. The only complaint I have is the massive amount of pointless tokens that have been included, specifically the voting tokens which I guess are great if you are the Black Knight, but effectively useless if you still possess hands to raise. Despite that, all of the pieces do fit comfortably back inside the box after each play, so you aren’t faced with the uncomfortable decision of throwing them away. You prefer quiet games and/or need time to think. This game can get quite loud and someone will always be arguing. As stated this game does not reward gaming experience and the outcome is a combination of guessing and how well you know the people around you. This game gets better the more people play it. It can’t be played with less then five people and isn’t that great with less than 7. There are a lot of unnecessary little markers that aren’t needed for the game to function. Even for a competitive gaming group this can serve as a fun warm-up/icebreaker. This game is 50% bluffing and 50% deduction. Please! Anything to stop playing Apples to Apples and Cards against Humanity! You can find this game for purchase here. Previous Previous post: Why do I still play Dota 2?